Press Release (ePRNews.com) - Coventry, CT - Apr 04, 2017 - ​​​​Today is a life-changing day for 6-year old Ruth of Coventry, Connecticut, as Service Dogs by Warren Retrievers delivers her Autism Service Dog “Loki.” Based in Madison, Virginia, Service Dogs by Warren Retrievers has a mission to provide specially-bred and trained dogs for adults and children with invisible disabilities like Diabetes, PTSD, Seizure Disorders, or in the case of Ruth—Autism Spectrum Disorder. Service Dogs by Warren Retrievers, “SDWR” has over 600 service dogs working across the US and around the globe. SDWR is currently serving almost 1,000 families. 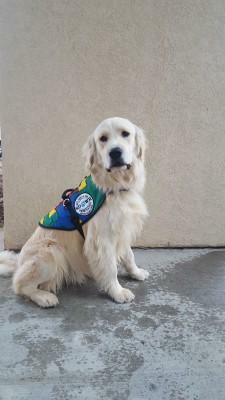 Loki, a golden retriever Autism Service Dog, has already received thousands of hours of training through SDWR’s puppy raiser training program where volunteers raise puppies in training for about a period of one year and then through the foundation and skill set training provided through SDWR trainers at the facility in Virginia. Loki will continue to learn under the careful guidance of a certified trainer from SDWR and through the rapport he develops with Ruth and her parents, Laura and Mike, at their home in Coventry. Ruth loves to play outside, sing and spend time on her iPad—just like other 6 year olds. But, since her diagnosis three years ago, Ruth faces the daily challenges associated with Autism Spectrum Disorder. “We have a real problem with elopement and her ability to understand danger” states her mom Laura. “She doesn’t recognize danger. And because Ruth has difficulty with sensory overloads and being placed in new environments, she has high anxiety in social situations,” says Laura. These are but a few of the common challenges of Autism Spectrum Disorder. New scientific research studies into Autism therapy provide positive evidence of the difference a service dog can make. Dan Warren states, “The studies showed children experienced fewer sensory overloads, ‘meltdowns,’ smiled more frequently, and had less frustration when around their service dog.” Autism service dogs are also trained to redirect away from repetitive and sometimes harmful behaviors as well as prevent elopement. Ruth will be tethered to Loki whenever she is out in public places and the service dog is trained to not allow Ruth to move away from her parents. With the arrival of Loki, Ruth and her parents will have yet another tool, a four-legged one that has received training to assist her to live a happier and more enriching life. Since Loki is a service dog and covered under laws in accordance with the Americans with Disabilities Act, he will be able to accompany Ruth everywhere—from restaurants to shopping to eventually going to school with Ruth every day.